Woburn – The Massachusetts Department of Transportation has announced that lane shifts will be implemented on a section of Salem Street in Woburn between Wildwood Avenue and Cedar Street beginning Tuesday, April 16th. 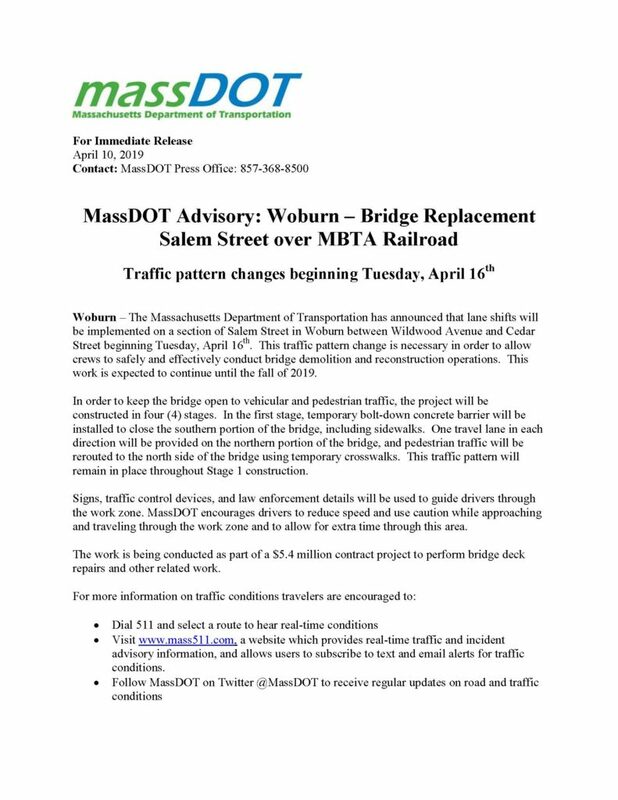 This traffic pattern change is necessary in order to allow crews to safely and effectively conduct bridge demolition and reconstruction operations. This work is expected to continue until the fall of 2019. In order to keep the bridge open to vehicular and pedestrian traffic, the project will be constructed in four (4) stages. In the first stage, temporary bolt-down concrete barrier will be installed to close the southern portion of the bridge, including sidewalks. One travel lane in each direction will be provided on the northern portion of the bridge, and pedestrian traffic will be rerouted to the north side of the bridge using temporary crosswalks. This traffic pattern will remain in place throughout Stage 1 construction. Signs, traffic control devices, and law enforcement details will be used to guide drivers through the work zone. MassDOT encourages drivers to reduce speed and use caution while approaching and traveling through the work zone and to allow for extra time through this area. The work is being conducted as part of a $5.4 million contract project to perform bridge deck repairs and other related work.